The man who has been called the “Michaelangelo of fantasy” has passed away. Frank Frazetta, the undisputed grand master of fantastic art died this past Monday from complications of a stroke at the age of 82 . Frazetta was one of the rarest kinds of artist, one whose work was so far reaching and groundbreaking that its influence on other artists, not only of his generation, but those who came after, was so great it could not even begin to be measured. Of all the great fantasy artists of the last century I can liken none to Frazetta in terms of lasting impact, sheer originality, and the ability to gain a constantly growing legion of admirers. He has left such a strong impact that he has forever changed the face of the fantastic arts. There are many others that had come before him who had beautifully painted and illustrated muscle-bound barbarians, gorgeous maidens, and fierce creatures. 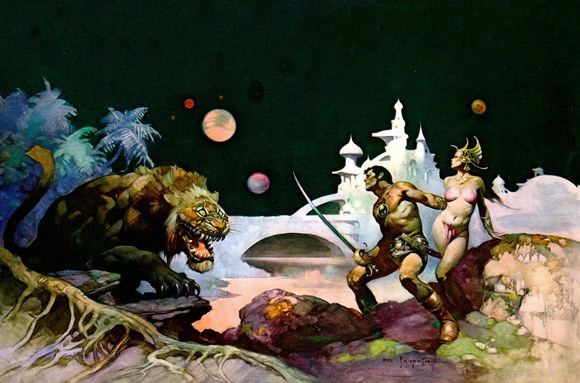 Yet only Frazetta had the innate ability to breathe such vivid life into his characters that it is easy to imagine that one is in the prehistoric past, on the face of Mars, or in the darkest jungles of Africa and witnessing the action first hand. Much of Frazetta’s early, 1950’s era work was within the comics field where he ghosted for Al Capp on the classic comic strip Lil’ Abner and various “funny animal” stories. Though this work is great, it is in the pages of adventure titles such as Thun’da, the Buck Rogers headlining Famous Funnies, and the E.C. title Weird Science-Fantasy that we see the fantastic other-worldly visions for which Frazetta would soon become internationally known. Frazetta’s comic story, Werewolf, was published in the pages of the first issue of Creepy in 1964. Though this was the last full comic story he drew, he would continue to produce many memorable covers for the magazine and its sister publication Eerie. A 1966 MAD magazine satirical shampoo ad by Frazetta featuring Ringo Starr would be the stepping stone for his highly successful career in book illustration and film poster design. 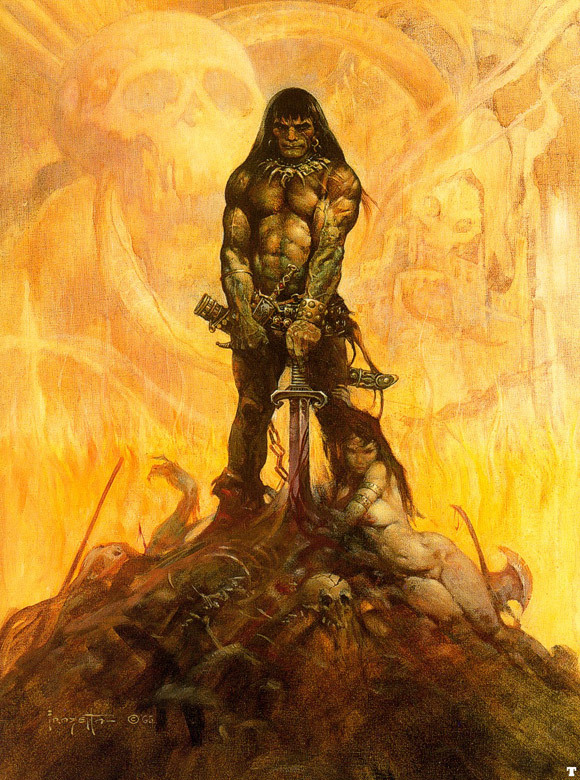 His paintings of Conan would become the all-time great depictions of the character and spur a resurgence in interest in the works of the barbarian’s creator Robert E. Howard. Frazetta’s work for the publishing world would spark an incredibly prolific era of acrylic and canvas work that would last for the rest of his career. A hallmark of Frazetta’s work is the gorgeous, voluptuous women that often populate his imagery. He is so renowned for his renditions of the female form that the phrase “Frazetta Woman” is a popular term that can be used independent of discussing the artist to describe a particularly statuesque and curvaceous lady. With Frazetta’s passing, some news items have taken to mentioning his depictions of “helpless” damsels in distress in need of being saved by brawny heroes. I feel that this is a huge misconception for describing a key element of the artist’s work. The women in these paintings and illustrations are anything but fainting females in need of a man to catch them. These are strong, independent, and sexually powerful women that could take on (or take down) any man that comes their way. Though Frazetta is famed for breathing vivid life into the creations of others, several of his most powerful paintings are of a character of his own creation: the Death Dealer. This brutal and supremely powerful warrior is to me the very definition of all the name Frazetta both implies and is capable of. The mystique of past aeons, the power of the unstoppable hero, the violence of battle, and the thick black smoke of its aftermath: all is delivered to an almost impossible degree of perfection in the Death Dealer pieces. These particular works are also superb examples of Frazetta’s usage of the triangle composition in which the specific elements within the image guides your eye to the object or detail he wants you to consider most. They say a picture is worth a thousand words. To me the Death Dealer paintings are worth a million, easy. Numerous highly memorable movie posters were also created by Frazetta, beginning with Woody Allen’s What’s New Pussycat?, a job given to Frazetta as a direct result of the MAD Ringo piece. Of all the dozens of poster images he created, my personal favorite is the painting for the 1977 Clint Eastwood film The Gauntlet, an image that perfectly captures the chaos (and violence) of the movie itself. Book covers and movie posters are far from the only commercial work the Frazetta name is seen on. With the rise of hard rock and heavy metal in the 70’s, many bands such as Molly Hatchet and Nazareth used Frazetta imagery on their album covers to accuenate the machismo of the music found within. Today the hard rock and Frazetta connection remains. Wolfmother, a band who idolizes and emulates the heavy bands of the past, used the powerful painting Sea Witch as the cover of their 2006 debut album. They also utilized several other Frazetta works for their singles, ep’s, and promotional art. Though his art made him famous, it is Frazetta the man who will remain most in the memories of those who knew him. 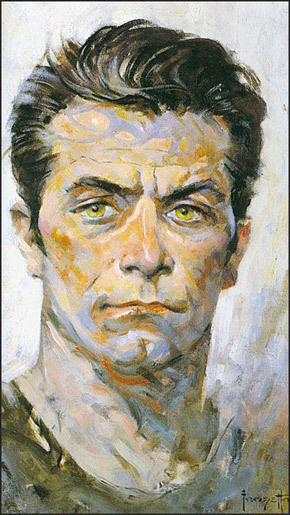 Known for his friendly nature and deep appreciation for his fans, the Brooklyn-born Frazetta was still very much a man’s man — a handsome, athletic, tough guy who would at times pose for his own muscle-bound creations. Still, the real source of inspiration for his lifetime of heroic, awe-inspiring, epic work was the love of his life, his wife Ellie. Married in 1956, she is as inseparable to the legacy and work of Frank Frazetta as every emptied tube of paint and every stroke of a brush applied to a blank canvas. She also posed for many of Frank’s paintings, both those that resided within the fantastical realm, and without. Ellie passed away after a bout with cancer in 2009. The work represented in this article is but a small sampling of the incredible body of work by Frank Frazetta. I recommend that those wanting to see more should start with the lavish books Icon, Legacy, and Testament from Underwood Books. Also recommended is the excellent 2003 documentary Frazetta: Painting with Fire. Frank Frazetta was a completely irreplaceable talent whose stature will only continue to grow as his place in the history of 20th Century art becomes more and more assured. I can only hope that Frank has now found his own personal Valhalla where he and Ellie are together once again.